Next up in our Year of Reading at the Irreal Cafe is Floating Tales by Jeff Friedman. Before I began reading this volume, I was aware that Friedman was a well-published poet, with six earlier poetry collections to his name, mostly brought out by Carnegie Mellon University Press. I knew that his work had appeared in many literary journals and anthologies (including The Cafe Irreal), and that he is also an editor and translator. Because of all those things, I expected satisfyingly polished and engaging work from Floating Tales, and that is what I got. In addition, I appreciate a good book cover, and MadHat Press has graced this volume with cover art that is subtle and yet delivers a twist, as Friedman’s writing usually does. The cover resonates with the title; it consists of grayscale images of water and landforms merged together in such a way that it’s hard to tell which way is up. Floating Tales was a pleasure to read, all the more because commenting on it gives me a chance to riff a little on the nature of the prose poem, which is to me the most confusing of literary forms. Inspired by my reading of Friedman’s work, I went on to do some reading about prose poems. For a woman who sometimes says, “We don’t publish poetry because Kafka didn’t write poetry,” that’s significant. In fact, I was even forced to change my view of Kakfa’s poetic output, at least in part. I had always thought of the pieces from Contemplation as creative non-fiction and/or fiction, but I went back and read them all again (in the volume Metamorphosis and Other Stories, which contains everything Kafka published during his lifetime). To be sure there’s poetic language to be found there, and I admit that a piece like “Looking Out Distractedly” works more like a poem than a story. “What shall we do in the spring days that are now rapidly approaching?” asks the first line, and the descriptive language in this short piece, combined with the satisfying yet unexpected nature of the concluding sentence, means it could be called a prose poem. I will not, however, concede that “Children on the Road” is a prose poem. In an earlier essay about this story, I described it as follows: “‘Children on the Road,’ … opens with a young boy sitting on a swing, watching life go by as adults make their way home from work, children run past, and people enact their social roles. [When] it’s dark, he eats his supper tiredly, and he watches passersby lethargically. Suddenly, he’s called by his friends to come out into the world he has only been watching up to this point. He says the children then ‘put our heads down and butted through the evening’ — and they sometimes ‘ran along in a herd,’ sometimes lay down to sleep on the ground, sometimes hurtled along roads and over ditches with alarming athleticism. This evocative piece contains many examples of the way in which Kafka uses descriptions of bodily activity — poses and movements — to express complex notions about the way human beings relate to one another and themselves. In this story, all bodily motion becomes body language. And when the narrator leaves his companions behind and instead of heading for home sets off ‘for the great city in the south’ where it is said that they never sleep, Kafka leaves us unsure where the dream state ends and the dream begins.” That, I think, is a description of a very Kafkan sort of story and not a prose poem at all. So now back to Friedman’s work: Floating Tales contains the same two types of short pieces – in some of them the writer is working more like a poet, but in others the reader finds all the trappings of short fiction. In “Fate Written on the Forehead,” on the one hand, we are given an artful description of the forehead the narrator sees when he looks in the mirror: “I see creases: a crow sitting on a branch perusing the long rows; a dog chasing a squirrel into a ravine; a woman bowing her head; an old man cursing the squirrels that tightrope the fence railing surrounding his garden.” But he sees no hint of what is to be: “Dust falls from my forehead but no matter how much I squint, I don’t see the word ‘truth’ or ‘death,’ so I may be like a golem, but I’m not actually a golem. No piece of parchment with a fortune printed on it pops from my cookie.” The conclusion of this short piece gives a satisfying twist, but “Fate Written on the Forehead” worked on me in much the same way as “Looking Out Distractedly” did. This piece describes an attitude toward the world that actually exists around us. On the other hand, the prose poems in Floating Tales that I think of as stories work differently from this, and a number of them involve animals, including horses, cats and bears. “Black Cat,” which appeared in Issue #48 of The Cafe Irreal introduces us to a cat who drinks vodka, has bad manners, procures its own samovar, and acts like a cat except when he doesn’t. “‘Get me some caviar,’ he ordered Serena. ‘There are going to be some big changes around here.’,” after which the narrator realizes that this is the cat from Mikhail Bulgakov’s The Master and Margarita. The cat in that novel, known as Behemoth, not only bears the name of a Biblical monster but has a taste for vodka and sarcasm. In this case, however, the presence of an obnoxious cat isn’t being used to make political commentary but to undermine the functioning of a seemingly peaceful household, and in turn is undermining our own expectations of what the presence of such a beast might mean. Then there are also a couple of pieces that feature bears, which I thought worked particularly effectively as stories. “Bear Fight” begins as follows: “When Liza fell in with the bear, I was more than disappointed as I had been in love with her since childhood. ‘What’s he got that I don’t?’ I asked as we walked past the diner together. ‘He’s a bear.’ She let go of my hand. ‘He gets a little jealous when I’m out with my friends.’” Because Liza loves someone the narrator thinks is a bear, he disguises himself as a bear to woo her, only to find out that his rival isn’t who he seems to be, but then neither is Liza. And then there’s “The Beer Bear” who asks for beer to go with what he has found in “the garbage dumpster he had just plundered.” The narrator tells us, “I went inside and uncorked a Sam Adams. ‘I’m sure that serving beer to a bear is against the law,’ I said, but handed it to him anyway. ‘Show me the law,’ he countered. He stood up to slug it down, and I could see he had a roll of fat around the middle, a big beer gut. Very unbearlike, I thought. ‘Give me another, please.’” In both pieces bears and bearishness seem to have something to do with stereotypical ideas of masculine behavior, but Friedman’s bears point toward something less clearly defined, as they keep metamorphosing in unexpected ways. “Besides, I don’t believe you’re a bear; you’re just a drunk disguised as a bear,” says the narrator. “’No, I’m a beer disguised as a bear,’ he answered, pouring himself into the bottle, where he became a bottle of bear.” Wordplay, by the way, is a feature of dreams, and we also love to see it in an irreal story. Earlier I mentioned Daniel Lawless’ introduction to Floating Tales and his discussion of Michael Benedikt’s The Prose Poem: An International Anthology. Besides Franz Kafka, Russell Edson is another name he mentions in association with this anthology. The three blurbs on the back of Floating Tales also refer to Edson in one way or another, either by comparing Jeff Friedman’s work to Edson’s or by citing Edson as a poet who is both a “fantastic fabulist” and a purveyor of “oneiric logic.” I decided to see what Edson had to say about prose poems, and I found an interview Peter Johnson conducted with Edson for a 1999 issue of The Prose Poem, an International Journal. When he is asked whether or not he is a surrealist, whether or not the “odd happenings” in his work put him in Breton’s camp, Edson says, “So many so-called surrealistic poems come across as stylized fakes, as very conscious attempts to be strange. My desire has always been to argue the case for reality. A good example is found in the works of Kafka, who explored the vaunted dreamscape, and yet was able to report it in rational and reasoned language. Language is sanity. We all teeter on the border of dream and consciousness. To pretend insanity is insulting, both to the clinically insane, and to those of us who strive for reality. Dreams, no matter how absurd or strange, are believable because they make physical sense.” This exploration of the dreamscape in rational and reasoned language is at least in part what we at The Cafe Irreal mean by irrealism (and indeed argue in essays such as “Irrealism is not a surrealism”). For me, the prose poem that works like a story can often do this very well, and many such examples can be found in Floating Tales. 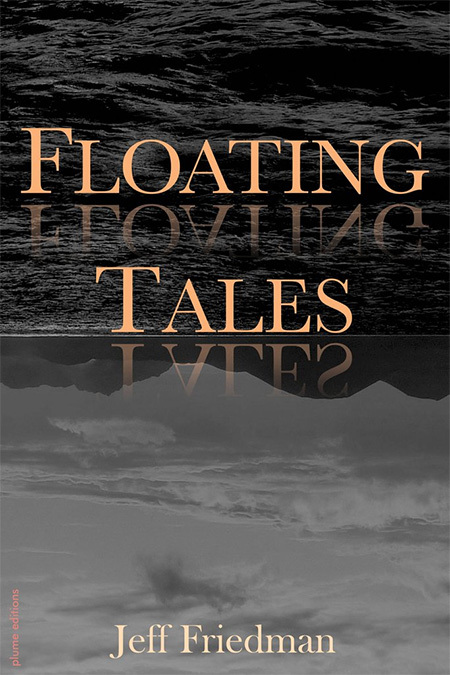 You can buy Floating Tales by Jeff Friedman at MadHat Press.